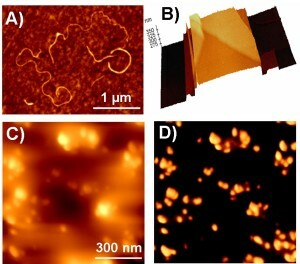 A) AFM image of carbon nanotubes dispersed on a polymer film surface; B) 3D AFM image of a structure; C) surface morphology and D) phase image of a sectioned polymer composite showing the dispersion of additives in the polymer matrix. Atomic Force Microscopy (AFM), which can be operated in air or water, uses a fine tip (apex radius ~10 nm) to map surface morphology and mechanical and chemical properties through an interaction between the tip and surface. Almost all materials can be measured without specific sample preparations. The AFM at Surface Science Western is used extensively to study polymer surface structures and properties. Topographic images at a resolution on the nanometer scale, and surface energy changes due to surface modification by UV/ozone treatment, can be measured using AFM. Dynamic force (tapping) mode AFM was developed to measure soft surfaces where the contact mode AFM could result in degradation on the surface due to the large applied force. Tapping mode is operated with a stiff cantilever (e.g., ~40 N/m), which is oscillated near its resonant frequency. In the dynamic force mode, the tip is oscillated at around its resonant frequency by applying a driving AC voltage to a bimorph on which the cantilever is attached. When the tip gets close to the sample surface, the tip-sample interaction forces cause the oscillation amplitude to reduce. This damped amplitude is used as the feedback parameter for imaging the topography of the sample. Another quantity measurable is the phase shift angle of the oscillating cantilever, which is the phase difference between the driving voltage and the oscillation of the cantilever as detected by the photodetector. It has been found that the phase shift angle is sensitive to tip-sample interaction, making phase shift imaging a powerful technique to distinguish materials having different mechanical, chemical and adhesion properties.